There's a digital gold rush sweeping the globe as investors try to cash in on Bitcoin, the notoriously volatile cryptocurrency. Getting involved yourself is easier—and riskier—than you think. As with any exchange or speculative market, trading in Bitcoin is a risky venture that could cost you real money—and lots of it. So the most important advice is to proceed with caution. If you're game, though, here's what you need to know to get started. Bitcoin is a currency much like any other, albeit digital. It can be saved, spent, invested, and even stolen. The rise of Bitcoin, the most widely circulated cryptocurrency, began in 2009 by someone (or someones) using the alias Satoshi Nakamoto. It came to prominence earlier this year when its value suddenly jumped 10-fold from $2 to $266 between February and April, with a peak market valuation of more than $2 billion. As a cryptocurrency, Bitcoin is generated through the process of "mining"—essentially using your computer's processing power to solve complex algorithms called "blocks." You earn around 50 Bitcoins once a block has been decrypted. The catch? Depending on how powerful your CPU is, solving a single block can take a year or more. Another means of obtaining Bitcoin is to simply buy it, exchanging physical currency for digital at a Bitcoin exchange like Mt. Gox or Bitstamp, or through a service like BitInstant. The simple answer is: just like physical currency exchanges. You're essentially buying one currency with another. The relative value of a nation's physical currency is a reflection of the country's economic and financial health, especially since we moved off of the gold standard. The U.S. dollar, for example, is worth more than that of the Mexican peso due to the discrepancies between the two countries' economies—therefore you can buy lots of pesos for very few dollars (the dollars being relatively more valuable). That said, exchanges like Mt. Gox act as intermediaries for currency transactions, converting wealth from Bitcoin to US dollars to other national currencies, back to dollars or Bitcoin. And that's how you make money. By exploiting the constantly shifting relative values of various currencies, savvy investors can make a tidy sum simply from moving money around these markets, in a process known as arbitrage. But they can lose it just as easily. Mine It: The easiest—but slowest—way into Bitcoin is to mine it. Set up a dedicated computer to do nothing but decrypt Bitcoin blocks, install some Bitcoin-mining software and let it do its thing. Again, doing so on a mid-range desktop could take upwards of a year or more to fully decrypt a single block. That's not going to be worth the time or effort. If you want your coins faster, it's going to cost you; purpose-built mining rigs start around a few thousand, like the $2,400 128 GHs Bitcoin Miner from Advance Mining Technology, and only go up from there. You can also build your own rig, however mining cards such as the Monarch BPU 300 C from Butterfly Labs aren't much cheaper. Basically, mining Bitcoin has gotten to the point that it's almost impossible to recoup your investment. So maybe you're better off not going it alone. Gang Up: You can also join a mining pool. These Internet-connected computer clusters break the work of a block into pieces that are shared among the group. Once the block is decrypted, the resulting Bitcoin is doled out according to how much work your rig contributed. There are a number of variations to this basic model, however, depending on how the pool is set up. Bitcoin.it has an expansive listing of popular mining pools with explanations of how each operates, pays out, and taxes users for their participation. The level of security among pools also varies greatly, from simply requiring a BTC username to requiring a 2-Step Google Authenticator code before paying out. Luckily, given the anonymous nature of Bitcoin, you generally won't have to include any personable, stealable, information. Still, money and complete strangers can be a particularly combustible situation. Play the Markets: The fastest—but riskiest—method is to go straight to the markets. So, say, for Mt. Gox, the reputed "world's oldest and largest Bitcoin exchange," you first have to sign up, create a user name and then respond to the confirmation your email verifying your address. But, once again, be warned. Just because it's a digital currency doesn't mean you won't lose real cash money trading in it. And given that the current Bitcoin market is more volatile than a bag of plutonium nitrate, multi-explosive, sound seeking projectiles, you stand a very good chance to lose a lot of money, especially if this is your first foray into day trading. So unless you have cash to burn or you're already a grizzled day trading veteran, you might want to take one more look at mining after all. So that's how you make your foray into Bitcoin. It's important, though, to first ask yourself if you really want to in the first place. Simply put, if Bitcoin is to be treated like legitimate currency, it's going to be taxed like legitimate currency. Don't pull a Bitomat.pl. This former mining company lost 17,000 BTC (worth about 14.5 Million USD) during a routine maintenance restart when the server hosting the company's digital wallet ate itself. 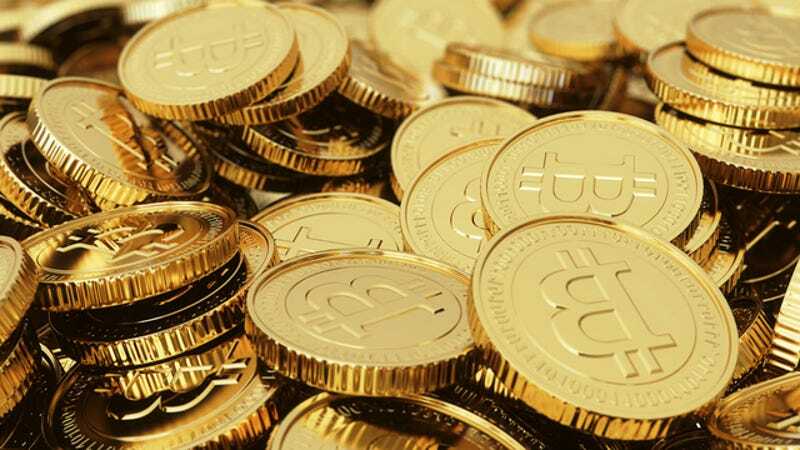 The Bitcoin's meteoric rise in value and the relatively low risk of being caught stealing it have also combined to make the currency a huge target for cyber criminals. Smaller online exchanges that have skimped on security systems can be hacked. The Sheep Marketplace, for example, had 96,000 Bitcoins (worth $220 million) stolen earlier this year, as did GBL and Tradefortress. Criminals also routinely target internet-connected computers that store individual Bitcoin wallets, attacking them with everything from malware and phishing tactics to old-fashioned social engineering. And as recently as last November, thieves stole nearly a million dollars worth of Bitcoin from Bitcoin Internet Payment System (BIPS), a Denmark-based Bitcoin payment processor. In short, even if you trade Bitcoin brilliantly, you're still susceptible to giant losses the good ol' fashioned way: theft. Regulation. It's the only way to bring the BTC markets under control, push out the criminal element, and make them safe for commercial interests to enter. While some investors see the upcoming regulatory crackdown as a death knell of the Bitcoin, it should actually do the opposite and finally reign in the currency's wild value fluctuations. Just as the crash of the poorly monitored sub-prime mortgage market led to the Great Recession, allowing the Wild West days of Bitcoin trading to continue will only lead to more and bigger crashes.